Bike share is a service in which bicycles are made available to individuals on a short term basis for a small cost. Bike share, often considered similar to public transport systems, supports people in travelling to and from transportation hubs and to their final destination. Bike share schemes have a role in Waverley LGA in providing easy access options to sustainable transport. Dockless bike share is a new business model where people are able to hire a bike through a smartphone app. Bikes can be used for return or one-way trips. Unlike the docked bikes you may have seen in cities like Melbourne, these bikes don't have to be returned to a docking station. You can ride them anywhere, anytime, as long as you use them responsibly. Please note that these bike share services are not owned or implemented by Waverley Council. If you are interested in using these services, or you spot a share bike which is causing obstruction, please contact the bike share companies directly. Note that the bikes can also be picked up and moved to an appropriate location if necessary by lifting the back wheel off the ground (the bike lock is usually on the back wheel). The following operators are no longer operating in Sydney. Please notify Council of the location of any abandoned bikes from these operators. Bike share users should park bikes in an appropriate place when they have finished their ride. This means keeping footpaths clear for path users. Share bikes are designed so they don’t need a bike parking hoop. Uses are encouraged to park near bike racks but not take up space for regular bikes that need to be locked to a fixed point. Bikes can be parked along landscaping. It is best to avoid obstructing access to paths, entrances and exits, especially wheelchair ramps. It is vital the Waverley LGA is a safe place for everyone. Please read our do's and don'ts of parking share bikes. 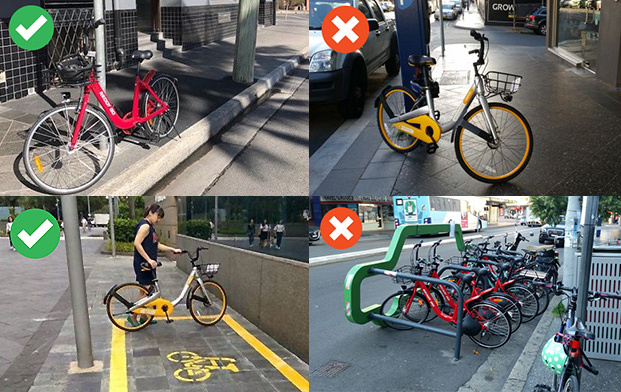 Waverley Council is investigating hot spots to setup ‘pop-up’ bike parking which are suitable for dockless share bikes and other bikes that don’t need to be secured to a rail. Riders should obey NSW Road Rules at all times. NSW Police enforce the road rules and can issue penalties for offences. Contact the Police Assistance Line on 131 444 for more information. 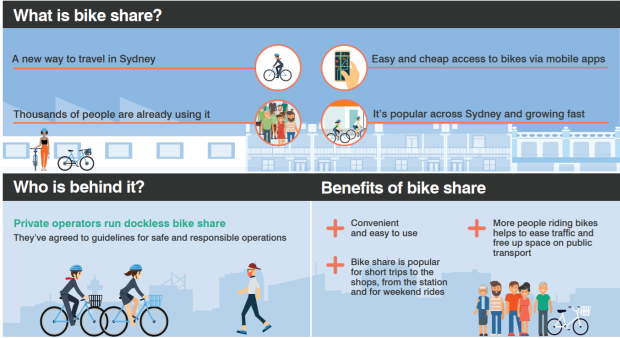 Bike share has an important role to play in Sydney’s transport future. Councils, public landholders and bike share operators are committed to working together to establish a balanced position that achieves transport, environment, health and other related goals as well as the fair use of public space. These guidelines set out minimum standards and expectations for dockless bike share operations in Sydney and will be in operation from 22 December 2017. Councils and relevant authorities will review operations every three months.